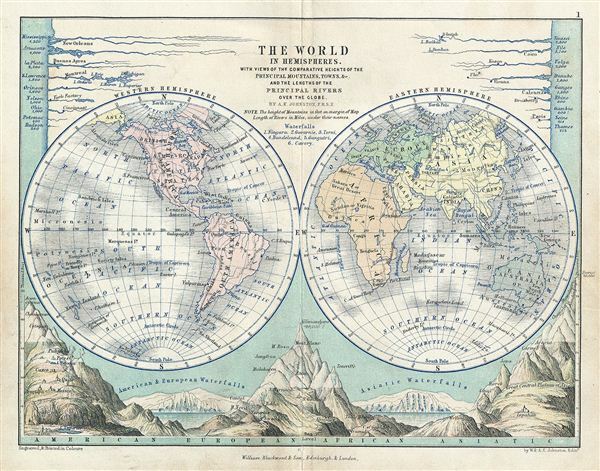 This is a fine example of Blackwood's 1852 map of the world in hemispheres. It depicts the Western and eastern Hemispheres with countries named, but their borders not depicted. The bottom portion of the map depicts the comparative heights of the principal mountains, towns, and the major waterfalls in America, europe and Asia. Along the left and right margins, the lengths of the principal rivers in each hemisphere are depicted. Various cities, towns, rives, islands and several other topographical details are noted. This map was drawn by A.K. Johnston F.R.G.S and published by William Blackwood and Sons to be issued as plate no. 1 in Atlas to Alison's History of europe. Blackwood and Sons (fl. 1804 - c. 1900) published out of Edinburgh and London throughout the 19th century - roughly from 1804 to 1898. The founder of the firm Scotsman William Blackwood (November 20, 1776 - September 16, 1834), was of humble origins, but his business acumen and dedication to the printing trade pushed his firm to prominence. He is most noted for publishing Blackwood's Scottish Magazine, one of the most important early magazines of 19th century England. In addition to his career as a prominent publisher, Blackwood took an active interest in civic matters and was elected Commissioner of Police in 1828. Following his death the firm was taken over by his sons, Alexander, John, and Robert Blackwood, who changed the imprint to "Blackwood and Sons". The firm was subsequently passed down through the heirs, most of the Blackwood name, until the late 19th century. Very good. Blank on veros. Minor wear on original centerfold.